Numovil was designed to help ensure your brain gets plenty of oxygen-rich blood, an important factor in mental acuity and overall brain health. Regular physical activity can improve circulation vital to the nourishment of your brain. It’s one step you can take to help keep your brain in top form. Numovil may be another. A program of sensible nutrition and exercise, in conjunction with Numovil, may help slow down the progression of memory decline by enhancing the level of neurotransmitters and improving blood flow to the brain. Numovil’s proprietary blend of premium ingredients includes vitamins C, E, and B12, along with ginkgo biloba. These natural substances may help improve brain circulation, increase the supply of oxygen and nutrients to the brain, and eliminate free radicals. Numovil also contains folate—important for making new red blood cells—and thiamin, which plays an important role in maintaining a healthy nervous system. Taking Numovil each day is a natural way to help ensure that your brain gets the nourishment it needs for healthy memory function. It’s a small step, but the results can be memorable. For adults only, take two (2) tablets daily, preferably with a meal. Numovil contains a proprietary blend of natural ingredients which help support improved memory and keep you feeling sharper and more focused. Other Ingredients: dicalcium phosphate, microcrystalline cellulose, croscarmellose sodium, stearic acid, magnesium stearate, silica and film coat ingredients (hypromellose, hydroxypropyl cellulose, polyethylene glycol with colors to be determined). Missing car keys, a forgotten phone number, a name that just slipped your mind. It happens to all of us. And as we get older, it may seem to happen more frequently. If you find yourself wishing you could concentrate with a bit more focus or remember details even just a little bit more, Numovil may be able to help. 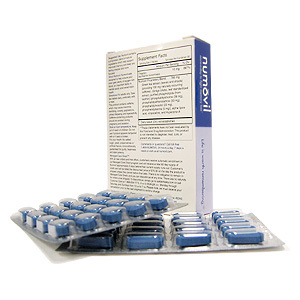 Numovil is a non-prescription daily tablet that provides valuable antioxidants and other nutrients that may help nourish the brain, promote healthy homocysteine levels, and protect against age-related memory decline. The proprietary blend of natural ingredients in Numovil helps support improved memory and keeps you feeling sharper and more focused. Numovil was designed to help ensure your brain gets plenty of oxygen-rich blood, an important factor in mental acuity and overall brain health. Numovil may help improve blood flow to the brain, promote overall brain health, and reduce the presence of free radicals—potentially dangerous molecules that can damage the body’s cells and interfere with their ability to absorb and use oxygen. Does Numovil have any side effects? Numovil customers have not reported any side effects. However, if you are experiencing any physical or health concerns, it is always best to see your physician. Will Numovil interact with my prescription medications? Although Numovil has not been reported to conflict with any other medications, it is always recommended that people taking medications consult with their physician before adding Numovil or any supplement to their diet. How often do I take Numovil? 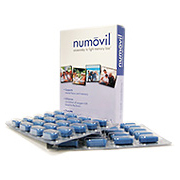 Take two Numovil tablets daily, preferably one in the morning and one in the afternoon. Can my doctor prescribe Numovil? Numovil is not a prescription drug. It is a non-synthetic, non-hormonal supplement that can be sent directly to your home or office. Does Numovil have a “shelf life”? To ensure freshness and quality, do not take Numovil that you have had for more than 24 months’ time. Numovil - is shipped in a discrete, unmarked package. Orders are processed immediately and usually take about 3 to 5 working days to be received. We do ask that you try it for 2 to 3 weeks to feel the full effects. Any information received is used only for order processing and shipping purposes. Your information, such as e-mail address, will never be disclosed to a third party.